On February 26th, I noted my skepticism about the ag sector. At the time ag ETF DBA was trading at $43. As of this posting, it is at $39.50. I received many e-mails disagreeing with my analysis. This post is not to boast, but to point out how important it is not to get caught up with the hype. When a stock gets too far extended and starts showing a negative volume pattern while moving higher, it is either topping or pulling back to support. While it’s still early to tell, most ag stocks look “toppish” and show poor accumulation. In fact, many, like the ETF, are showing distribution patterns. 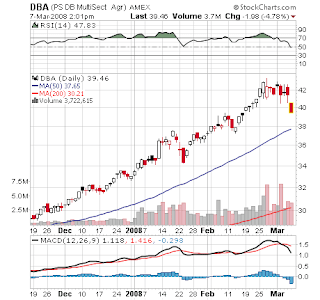 While I’m not ready to short DBA yet, if we get a break of the 50 day ma, all bets are off. One final note: If the stock makes a huge comeback today and closes positive, negate everything I just said and go long. It will have printed a long tail on heavy volume. That’s very bullish.